I am a girly girl and adore flowers. I usually get more practical gifts, but this week I got roses. I about swooned. 🙂 My husband is practical and frugal and rarely buys me flowers just for fun. I would love these to be delivered to my door weekly! available. Measures 15″H by 12″L. I was surprised at 10am with a bouquet of flowers at my door for a review. The bouquet was gorgeous and smelled heavenly. 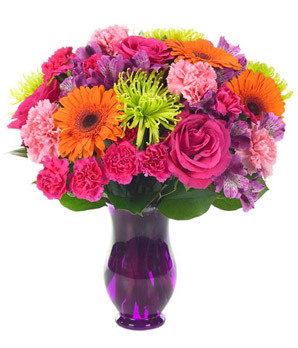 I love bright and funky flowers and this bouquet has them. All my friends who came to my house commented on how beautiful the bouquet was and how they wanted one. Hint to the men out there lol. The flowers in the bouquet lasted for 2 weeks and that has been with my house at being at 75 degrees or lower at times. I really loved this review as I felt special having flowers delivered to my door.